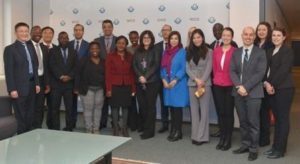 The first WCO Global Accreditation Workshop on Human Resource Management (HRM) was conducted from 4th to 8th February 2019 in Brussels, with the sponsorship of the Customs Cooperation Fund of China (CCF-China). Following nominations by the WCO Members, the WCO Secretariat evaluated applications based on pre-determined criteria. This resulted in the selection of thirteen (13) participants from eleven (11) Customs Administrations to participate in the workshop. During the intensive five-day workshop, participants displayed their expertise through presentations, group exercises and role-playing sessions. At the end of the event, candidates who successfully completed this workshop were designated as WCO pre-accredited experts, and as part of the second phase of the accreditation process, will be invited to an in-country mission as co-facilitators. Pre-accredited candidates who successfully complete the second phase will then become WCO Customs Modernization Advisors for Human Resource Management (CMA-HRM).